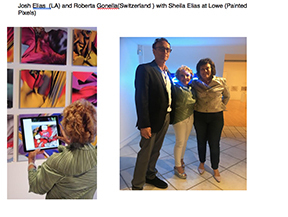 Miami, FL– Sheila Elias, famed Miami Artist, hosted a successful art exhibition that allowed guests to literally interact with the art, using an iPad, when after hovering over, 3D characters and figures would pop onto the screen, and bounce or dance off the walls, creating a huge spectacle, or “Painted Pixels” at the Lowe Art Museum, University of Miami on the evening of May 17th. 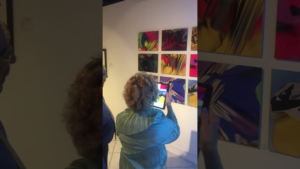 The exhibit will be on display until September 23, 2018. 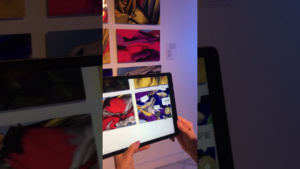 Sheila Elias’ iPad painting exhibition is the first to combine in a way that has never been done before. I do many sketches every day and some are related to final finished products. I produce these as scales on a piano to write the symphony or a writer writing notes for a novel. There is a great deal of freedom doing small sketches both in content and material and this allows more freedom in the final stages. I like to bring an awareness of new directions and individual inventiveness. The evolution of technology has always paralleled my work throughout its development. From the original copy machine to today’s iPad, the influence of electronics permeates my process. Through life experience, I incorporate visual, emotional, and psychological impressions and feed them into my art. My work, whether it is photography, sculpture, or paintings, has always been a visual interpretation of my internal landscape, which is significantly influenced by external landscapes. I attempt to portray a visual language that has hopefully not been spoken before.